An update to a free online music production program includes new virtual instruments and allows users to compose with their voices. Amped Studio 2.0 lets the user record and play both audio and MIDI content simultaneously on the same track, while also adding as many other instruments and effects as he or she wants. A paid subscription version for $4.99 per month includes more sounds and audio options. The latest release includes two free web audio module (WAM) instruments: OBXD and DEXED, each based, according to the company, on famous classic analogue and FM synths. A WAM is an audio plug-in format that lives online and can be used in a browser, allowing for access to virtual instruments without having to download or install anything. The synthesizers can be tried out at the company's WAM website. 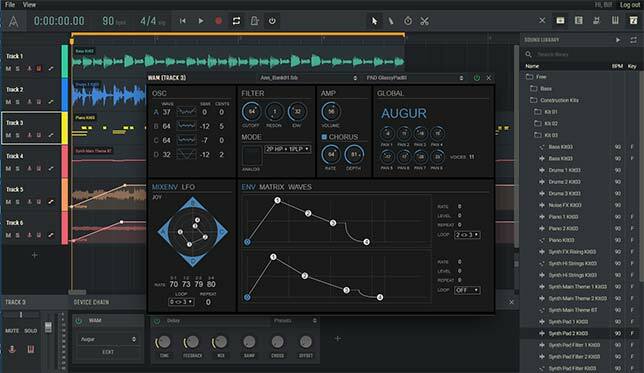 New pitch- and beat-detection technology, Hum and Beatz, enables users to hum or beatbox into the workstation and have the software automatically create MIDI notes and beats, which can be assigned to a virtual instrument. A demonstration has been posted to YouTube. The new version also includes volume and panning automation and a content editor that facilitates "more sophisticated" editing of audio tracks. Amped Studio 2.0 runs on Chrome, Vivaldi and Opera, and will eventually work in other browsers in time. The program can be launched on the Amped Studio website.